Charles Dickens and I have a love/hate relationship. I love his writing (hence the reason for including him the fan/fandom post), but I could never have sustained a real-life relationship with the man. He is the centering focus of my dissertation, so we spend hours together on a regular basis...and I think we have had some serious knock-down, drag-out fights, too. When I left my job at Southern Living magazine in 2000, I came back to the university as an undergraduate again and started the English degree. My first semester, I met Dr. Myron Tuman, one of my most favorite professors ever, and he assigned Oliver Twist for our class in Victorian literature. I enjoyed it, but I also fell in love with the Brontes and George Eliot all over again. Dickens hovered in the background and I didn't think much about him. In fact, he never appeared again during my undergraduate time or my master's courses. When I started graduate school as a master's student, Dr. Tuman had already turned me into a Victorianist, but I was more interested in Eliot. So, I did my final paper and defense on George Eliot's Scenes of Clerical Life, and I never even thought about Dickens. In fact, I was so attached to Eliot, that I planned to do almost all of my dissertation research on her one day. Well, a couple of years later, when I finally began PhD work, I had to register for classes at the University of South Florida (where I began my doctoral studies). My first semester was heaven. I signed up for a Victorian literature survey and an eighteenth-century literature course with another most favorite professor, Dr. Laura Runge. (If I wasn't a Victorianist, I would totally be an 18th-cent. scholar. Dr. Runge is amazing.) But, at USF, you must sign up for a third class...and I debated about this one for ages. There was a seminar course offered that drew my attention: this one on Dickens. I wasn't exactly opposed to taking it, but when you are a nineteenth-century scholar, then you end up reading REALLY long books. I already had classes with REALLY long books, and I was worried about being able to keep up. Still, I couldn't turn down the opportunity to take two Victorian literature classes! (USF was a haven for course selection compared to UA!) So, I signed up for the Dickens seminar. As I bought my books, I inwardly groaned. My experience with Dickens was limited and all of the novels on the list were long and completely new to me. Still, I sucked it up and prepared myself. The first class was on a Tuesday evening, I believe. Our professor, the amazing Dr. Pat Rogers, came into the classroom, and from the moment he opened his mouth I was hooked. Yes, all I did that semester was read and teach. I actually had a reading schedule. Our first book in the Dickens seminar was The Old Curiosity Shop. I started reading it and I couldn't put it down for long. I love that book! I still do. Then, we read Martin Chuzzlewit, Bleak House, and Our Mutual Friend. I didn't like Martin Chuzzlewit, but I did like Our Mutual Friend. However, I LOVED Bleak House. I think this is my favorite novel. Period. As in of every novel ever written. Though I feel in love with The Old Curiosity Shop, Bleak House fed my soul and made me cry and feel. I actually hurt when I read parts of that book. The only other reading experience I have had that is comparable: when I read Antony and Cleopatra (Shakespeare's) and "Medea" by Augusta Webster (really, anything by her). I guess what I am saying is that if I only had to take a few books to a desert island, I would choose Bleak House, Antony and Cleopatra, and a book of Augusta Webster's poetry. But back to the point. Dr. Rogers made me love Dickens's writing. I say "writing"...because Dickens the man? Not such a big fan. Most of the time, when I read about him and his controlling nature, I just want to hurt him. :) And he is such an imposing figure. 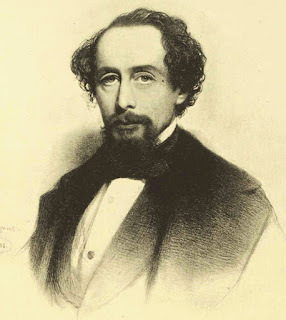 I mean, in spite of the fact that he had not been assigned as required reading during most of my educational career, Dickens is still THE Victorian author. So, when I began to write about him, I felt extremely nervous. But Dr. Rogers thought that I was doing good and important research, and he really encouraged me. Even after the semester was over, I couldn't get Dickens out of my head. I kept coming back to him, and Eliot no longer fed me in the same way. You see, all of scholarly research is really selfish. Literature students are probably the most narcissistic people in the world and we don't realize it, necessarily. But, it is a good kind of narcissism, if practiced in the correct way. In order to seek and grow, we have to be narcissistic, a bit. The books we pick up help us along the way. When I was working on my master's degree, the religious aspects of Eliot drew me to her, because I was confronting certain issues in that area. But, in the background of my paper, I was also writing about an orphaned child. The orphans in Dickens...they are what drew me in. I suppose we all feel like orphans in some ways, and I won't go into all of that here. But let's just say that the orphan metaphor is complicated and can mean lots of different things to lots of different people. It is no wonder that when I was in Tampa, hundreds of miles away from friends and family, that I latched on to these children in Dickens's writing. When I came back to UA, after my dad got sick, I continued to write about orphans (in all of Victorian literature, but still thinking of Dickens) with a new perspective. Dickens allows me to explore my interest in this topic in so many ways because his works are richly composed and so multi-layered. Also, he is talking about a world very similar to our own. We like to think the Victorians were so different from us, but they weren't. In many ways, they are strangely like us. It is scary. But, Dickens...wow. He really is amazing. And I do recommend that everyone should read at least one Dickens novel in their lifetime. I like most of them, but here are my three favorites: The Old Curiosity Shop, Bleak House, and Great Expectations. Of the three, Bleak House is a harder read because of the dual narration, but give it a chance. It is amazing. If you just can't handle a novel that is over 800 pages long, then try reading some of his short stories, for they are usually pretty good as well! Or...if you don't want to read Bleak House, you can always check out the incredibly well done BBC version. Gillian Anderson plays Lady Dedlock, and she is PERFECT! ALSO: Here is a trailer...featuring (at the very beginning) a favorite scene with Anderson! Thanks, Amy! I hope you are doing well! My god ! I know hardly anything about you, Susie, but get the feeling that you are an expert in English. I also love some of Charles Dickens' works. I just can't recommend any good book to a person like you who herself seems to be a well read and erudite person. Perhaps you can..to me !! I am from India and love the English language. Thank you for commenting on my blog! I am not an expert, but I do love Dickens! I like all kinds of books, and any book you recommend would be appreciated by me. What kinds of stories do you like? Do you like English classics from authors such as Dickens? I can recommend more to you. Do you like action or romance or what? Just let me know! I love him, too! I did end up finishing and defending my dissertation (mostly centered around Dickens), and I had to take a break for a while. But I am now rereading ALL of Dickens! I am super into it. I had only read parts of 'Sketches by Boz,' but I am reading all of it this time, and I have found myself laughing out loud many times! He really is funny! I love Borges, too! Thanks for commenting!